Here is the start of my adventure harvesting seeds from the heirloom tomatoes I started from seedlings purchased in Saratoga Springs in May. This is a wild, out of the blue question, don’t read too deeply into it, it’s asked in complete honesty. Have you gone Buddhist? I think I always had the ingredients but never made the pie. It’s pretty yummy. I so want to take that as a Yes. You’re using the ‘ferment’ method? I’ve just dried the seeds and they grow the next year, but professionals use the ferment method. I am going to try fermenting my seeds this year. Thanks – I’ll check it out. 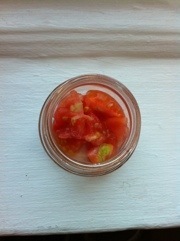 I have been using the ferment method for the cukes and tomatoes but I’m about to give up on it for the cukes. The handbook that I copied a link to (Vegetable Seed Saving Handbook by Jack Rowe) suggests leaving the cukes on the vine till well past time they’re ripe and then leaving the cukes alone for another twenty days before extracting the seeds. I don’t know that my kitchen can take this without attracting tons of bugs and fruit flies. Maybe it would work in the fridge but the thought of leaving a cuke in my cooler for a full twenty days past its due also skeeves me out What have you been doing? Last year I saved some cuke seeds straight from the fruit as I was eating it in my salad. I picked the largest & fullest seeds, then washed off the vinegar and oil before air drying. They grew this year, just very small plants. I doubt my seeds were the reason for small plants since most of what I grew was on the small side. The hardest part of seeds direct from salad is that I always loved eating cuke seeds. Try saving a few big and full seeds from your salad- dry out a few and try putting a few more in a pot or the ground as a test. They should grow, and you’ll have the rest for next year- nothing lost either way. I still have a couple seeds left, if I clear out some ground later I’ll give them another try.